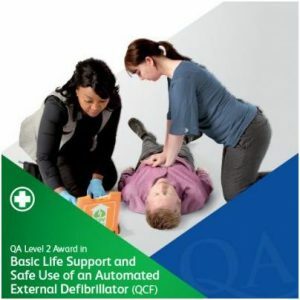 Level 3 Award in The First Person on Scene Intermediate (RQF) qualification has been designed to provide the knowledge and skills to stabilise a patient for up to forty minutes until an ambulance or other pre-hospital care provider arrives. 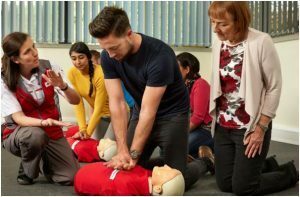 The knowledge and skills taught as part of the course are designed for the first person at the scene to intervene within a scope of practice to utilise life saving interventions to preserve life and prevent deterioration of the patient. This qualification is the foundation for AoFAQ’s suite of Pre-Hospital Care qualifications and enables progression up to a Level 4 Diploma. 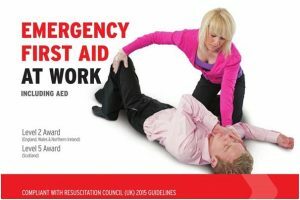 There are no specific requirements to undertake the qualification however it is strongly recommended that learners hold an emergency first aid at work qualification or equivalent and hold a level 1 or above in literacy and numeracy. Learners must be 18 years of age or older to commence the training. Note: The term “FPOS” must not be used with this qualification as FPOS is a registered Tradename of Pearson. This restriction includes but not limited to training, assessment and marketing materials.” The AoFAQ Level 3 Award in the First Person on Scene Intermediate (RQF) qualification is a new Level 3 qualification. Support: Scheme of work, Comprehensive PowerPoint now available. • 1.1 Explain the role and the responsibilities of the first person on scene. • 1.2 List the types of personal protective equipment to be worn at an incident. • 1.3 Explain the principles of scene safety. • 1.4 Explain how to minimise the risk of infection. • 1.5 Explain how to undertake a dynamic risk assessment of an incident scene. • 2.1 Differentiate between the capabilities of different emergency services personnel. • 2.2 Explain the principles of using appropriate radio communications at an incident. • 2.3 Differentiate between patients using the principles of triage to manage in accordance of the most life threatening conditions first. • 2.4 Demonstrate scene safety management. • 3.1 Explain the requirements for gaining consent from a patient before providing emergency care. • 3.2 Explain the principles of communicating with patients. • 3.3 Explain how to undertake a manual handling risk assessment. • 3.4 Summarise the functions of the spine. • 3.5 Summarise the principles of how to keep the back healthy. • 3.6 Summarise the principles of undertaking a primary survey. • 4.1 Demonstrate how to assess an incident for any dangers to the first person on scene, the patient and others. • 6.1 Explain the term ‘catastrophic bleeding’. • 6.2 Explain the recognition features of catastrophic bleeding. • 6.4 Demonstrate how to apply direct pressure. • 6.5 Demonstrate how to apply indirect pressure. • 6.6 Demonstrate how to apply a tourniquet. • 7.1 Summarise how to recognise an obstructed airway. • 7.2 Demonstrate how to place the patients head in neutral alignment. • 7.3 Demonstrate how to open a patient’s airway using the head tilt and chin lift procedure. • 7.4 Explain the types of situations which may indicate a cervical spine injury. • 7.5 Demonstrate how to open a patient’s airway using the jaw thrust procedure. • 7.6 Demonstrate postural airway management. • 7.7 Demonstrate how to use suction. • 7.8 Demonstrate how to size and insert an oropharyngeal airway for an adult. 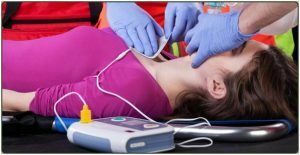 • 7.9 Demonstrate how to manage an adult patient who is choking in accordance with current guidelines. • 8.1 Demonstrate how to assess if a patient is breathing normally. • 8.2 Perform a respiratory assessment for breathing rate, depth and quality. • 8.3 Demonstrate cardio-pulmonary resuscitation on an adult manikin in accordance to current guidelines. • 8.4 Explain the safety considerations when using an automated external defibrillator. • 8.5 Demonstrate how to use an automated external defibrillator safely and in accordance to current guidelines. • 8.6 Explain the safety considerations when using oxygen. • 8.7 Demonstrate how to administer oxygen via a bag valve mask. • 8.9 Summarise the different causes of unconsciousness. • 8.10 Demonstrate how to place an unconscious patient in the recovery position. • 9.1 Demonstrate how to assess the presence, rate and rhythm of circulation. • 9.2 Demonstrate how to assess a patient’s capillary refill time. • 9.4 Explain how to estimate the amount of blood loss based on the types of wounds. • 9.5 Demonstrate how to manage a patient who is bleeding. • 9.6 Explain the term ‘shock’. • 9.8 Demonstrate how to manage a patient in hypovolaemic shock. • 11.1 Explain how to examine the clothes and areas surrounding the patient for signs of external bleeding. • 11.2 Perform a head to toe secondary survey. • 12.3 Demonstrate the safe use of an adrenaline auto injector using a training device. • 13.3 Demonstrate the application of a cervical collar. • 13.4 Summarise the recognition features and management of burns and scalds. • 13.5 Summarise the management of a patient with an eye injury. • 14.1 Explain the term ‘sepsis’. • 14.2 Summarise the recognition features of red flag sepsis in accordance to current guidelines. • 15.1 Explain how to handover a patient to a healthcare professional. • 15.2 State the purpose of a range of emergency care equipment. • 16.1 Demonstrate how to perform cardio-pulmonary resuscitation on a child and an infant in accordance to current guidelines. • 16.2 Demonstrate how to manage a choking child and infant in accordance to current guidelines. • 16.3 Demonstrate how to place an unconscious infant and a child in the recovery position. The practical Learning Outcomes are assessed by observation.